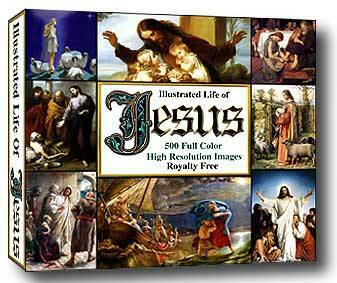 When you purchase our "Illustrated Life of Jesus" Art CD or our "Illuminated Initials" cd, you are enabling us to give this site the daily attention it requires while we work to upload the thousands and thousands of free images and free Bible study, lessons and commentary from our personal as well as public collection. And don't forget - these Christian art cd's make wonderful gifts! You asked for it, and a year in the making later, it's now available - 700 specially selected images not available on this site, chosen for their kid-friendliness and ability to illustrate the life, ministry and teachings of Jesus. Beautiful images, organized by verse in high resolution on CD-ROM. How many times have you spent hours searching for the images you need this week, only to find the quality was too poor, the image too small, or worse - you found nothing at all? Imagine having 700 royalty free super high-quality image choices, many for each subject, story or parable, all the right size, kid-friendly and all in full color. No more wasted time searching and editing. Beautiful rare images never seen before as well as those hard-to-find favorites to delight you! We are placing at least one of these images on each Bible Story page from the New Testament so you can see how special they are. (Watermarks will not appear on the CD images). Cleaning and restoring these images to their original beauty has been a labor of love, and you will be THRILLED when you see the quality and choices you now have right at your fingertips. 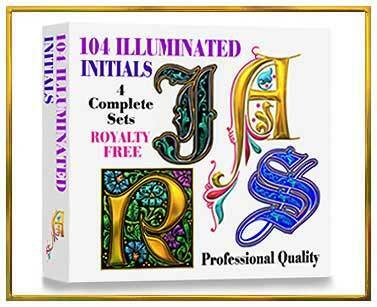 Royalty free artwork collection in four complete sets of beautiful illuminated initials in high resolution on cd for all your art and design projects.